CCAL is currently working on a short documentary about Voices from Shandon to be premiered later this year. The Documentary will look at the thematics of the project, its beginnings, collaborations, process and resulting impact on the local community and visitors to the city. The CCAL Team are currently looking for footage and photographs of the installation taking from different vantage points around the city. If you have photographs or video footage that you would like to submit please contact info@corkcommunityartlink.com. A TV crew from RTE's Kidspeak visited Shandon today to interview young members of the Cathedral Cairde Youth Club. The short, to be aired on RTE2 and RTE Junior is about the Voices from Shandon Flag installation currently in place on St. Anne's Tower in Shandon and features members of the Cathedral Cairde Youth Club talking about their flag and experiences participating in the project. Kidspeak is a series of 30 second to 1 minute films showing Irish youngsters engaging in a broad range of pastimes and projects. The films are shot in a variety of locations around the country. They are broadcast on a rolling daily basis throughout the year on both RTE2 and the dedicated Young People’s Digital channel RTEJr. A TV crew from RTE's Kidspeak visited Shandon today to interview young members of the Cathedral Cairde Youth Club. The short, to be aired on RTE2 and RTE Junior is about the Voices from Shandon Flag installation currently in place on St. Anne's Tower in Shandon and features members of the Cathedral Cairde Youth Club talking about their flag and experiences participating in the project. 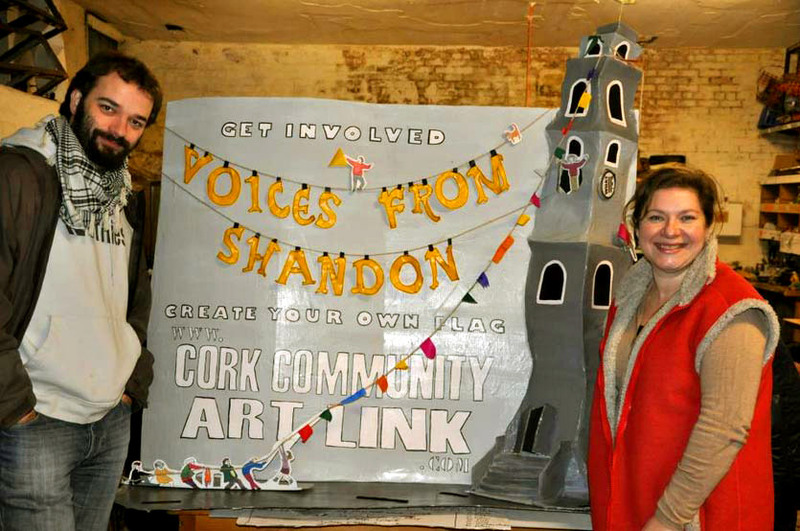 The Launch of Voices from Shandon undertaken by Cork Community Art Link in collaboration with French Artist Didier Gallot-Lavallée took place on Saturday 15th of June marking the culmination of an extensive community arts project. The event saw 1000 flags made by 1000 individuals from across Cork and Plovdiv in Bulgaria raised on Shandon Tower. 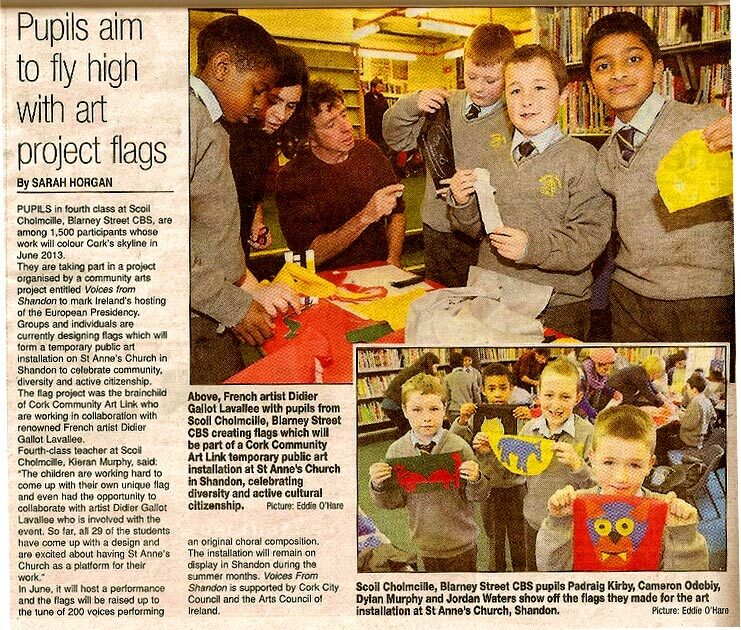 The project was part of a large scale flag making outreach programme which took place in schools and communities across the city over the past year celebrating community and diversity. The flag raising ceremony on Saturday marked the end of a the year long process which saw the participants creating individual flags representative of their own identity in schools and community associations. The project also featured a strong local musical programme with composer John O Brien commissioned to write a series of original compositions performed by children on the day. The choral outreach programme was delivered by Sonia Keogh in 4 primary Schools; Scoil Aiseiri Chriost, North Presentation Primary, Cork Educate Together and St Maries of the Isle. 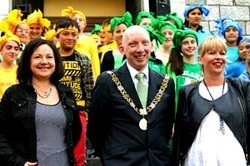 The flags were raised in an explosion of colour from the top of St Anne’s Church in Shandon with a team of 100 volunteers to the delight of a 1000 onlookers and the Lord Mayor Cllr John Buttimer. Supported by Cork City Council and the Arts Council of Ireland’s EU Presidency Culture programme Voices from Shandon is one of many projects taking place nationally to support Ireland’s hosting of the EU Presidency. 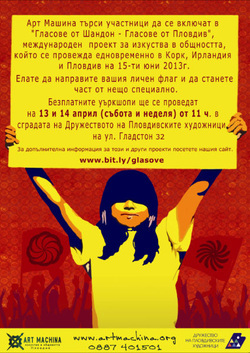 Our Voices from Shandon collaborators are busy in Bulgaria, heres what they have been up to! These flags will be sent to Cork and become part of an installation of 1000 flags on Shandon Tower to be raised on the 15th of June. Collaborating community arts organisation, Art Machina, in Plovdiv Bulgaria will commence their flag making workshops in Plovdiv on the 8th of April working with a number of local organisations. These flags will then travel to Cork and become part of the installation on Shandon Tower in Cork which will be raised on June 15th. Artlink staff joined Cork City Council staff in a workshop at City Hall last week to create flags for the Voices from Shandon project. Nice photo in this week's Cork News and Evening Echo of our EVS and Leonardo volunteers - Charlene, Melanie, Sandra, Claudio, Sergio and Maela with their designs. Read article by clicking on the image. As the number of flags is growing nicely, Didier Gallot Lavalle came back in residency for further development of the project and a new test on St Anne's Church in Shandon. We are delighted to be working with Composer John O Brien and Opera Singer and Youth Music Specialist Sonia Keogh for the Voices from Shandon Project. John will be composing an original choral composition with young people which will be performed by 125 children under Sonya's direction in June as part of a flag raising performance celebrating community and diversity during Ireland's Hosting of the European Presidency.